The site for this project is located on the coast off the Great Highway, adjacent to a wastewater treatment plant. The form of the project was discovered through an analysis and interpretation of a series of inhab- itable book studies and the building was sited based on a study of the voids and cuts made through out the site. The building is purposely made tall and thin to create a hulking inhabitable book presence on the site. The entrance side is opaque, containing the program that is considered to be internal functions to the building (administration, utility spaces, etc). The opposite side, facing away from the highway, is more transparent and opens itself up to the site since these functions are considered more external to the building (circulation desk, interactive reading spaces, etc). The narrow ends of the building sit in the void of the site and selectively frame the views out to the ocean. The Inhabitable Book Concept: An individual makes a choice by reading. The reader acknowledges the power of books and becomes connected to the larger society while engaging in a highly introspective and reflective activity, of reading as a deeper understanding of self through this process of reading. This library is a place to honor the power inside books and the energy created by bringing them together with readers who can investigate, wonder, and give back. The Program: This library is a place for the public to get away from downtown and to experience the coast. The book collection hangs over the larger, more open reading spaces, which wraps through the entire building. The entry level, containing most of the administrative spaces, is connected to the major atrium, intended to be the place with the highest level of noisemaking activities. Opposite these wrapping spaces, is a core of small, intimate reading rooms, allowing intensive, individual focused thought, while having the only view out to the ocean. 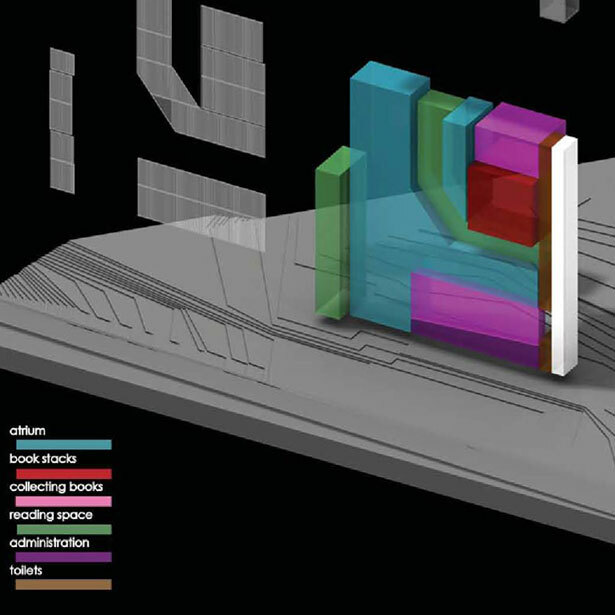 The circulation sequence of the building attempts to focus the reader on seeing selectively framed views of the ocean as one moves in and out of spaces in the building.